JMI issued the schematic for the circuitry of the first generation AC-100 head on September 9, 1963. 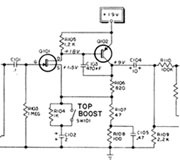 Given the identification number OS/036 and named the "80-100 Watt Amplifier Circuit," it detailed the cathode biased, no negative feedback (NFB) power amp circuit used in the earliest AC-100 "MkI" heads. While JMI produced nearly 2200 AC-100 heads, only about 350 featured the original cathode biased, NFB "80-100 Watt" circuit. 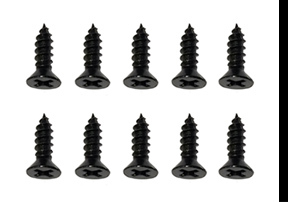 Rated at ~80 watts RMS, about 125 of these AC-100 heads were equipped with a "thin edge" head cabinet made of 3/8" plywood. The balance were equipped with a "thick edge" head cabinet made of 3/4" plywood. The aluminum ID plate on the back panel of the AC100MkI head shown on this page displayed serial #215 (serials started at #101), making it a earlier example of the model. 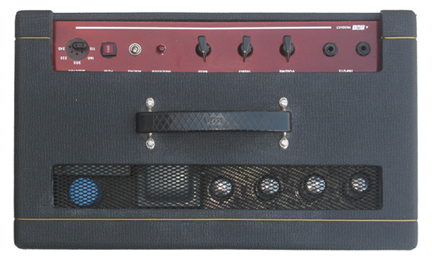 Serial #215 had a thin edge cabinet, red control panel, a one piece logo and brown grill. 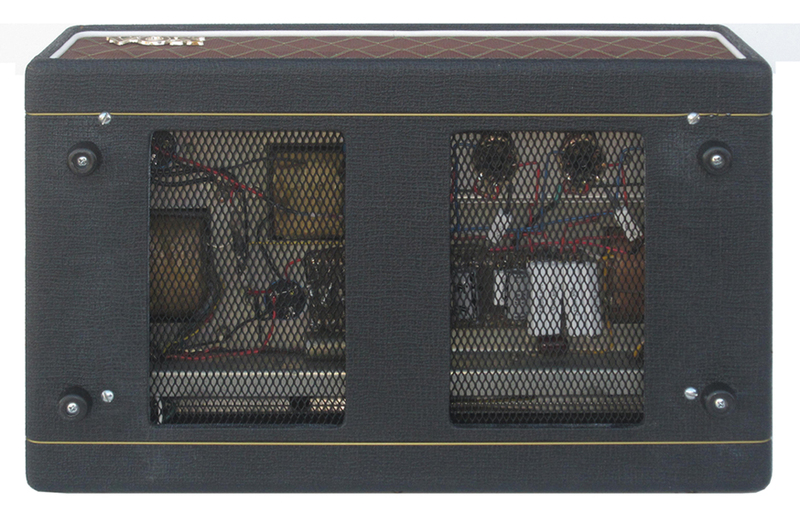 The cathode biased, thin edge AC-100 has special historical significance as it was the amp model used by Paul McCartney when the Beatles arrived in America in February 1964. When the Beatles returned to tour America later in 1964, John Lennon and George Harrison were also playing their guitars through cathode biased, thin edge AC-100 heads. 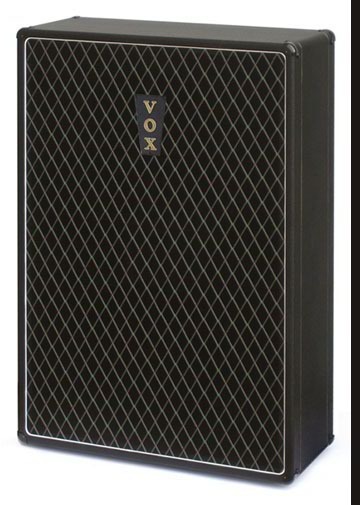 In addition to the connection with the Beatles, the AC-100 MkI is loved for its touch sensitive response and uncompressed tonality. 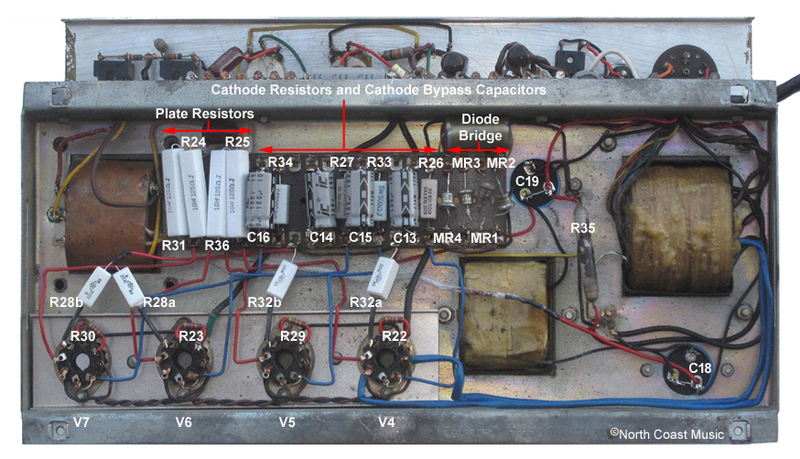 The photos near the top of the page reveal that four 270Ω cathode resistors (R26, R27, R33 and R34) and four cathode bypass capacitors (C13, C14, C15 and C16) are located on the lower tag strip of the AC-100 MkI circuit. Four 1kΩ screen resistors (R28a, R28b, R32a and R32b) were mounted between the lower tag strip and pin five of the output tube sockets. As output tubes have to draw quite a bit of current to bias themselves, cathode biased amps such as the AC-100 tend to be a little less powerful and generate more heat than fixed bias amps. For this reason, the AC-100 Mk1 produces about 80, not 100 watts. It is easy to spot if an AC-100 head has the cathode bias circuit by looking through the ventilation screen on the bottom of the amplifier (see image at left). If the lower tag strip has four matching resistors and capacitors, it is a cathode biased amp. 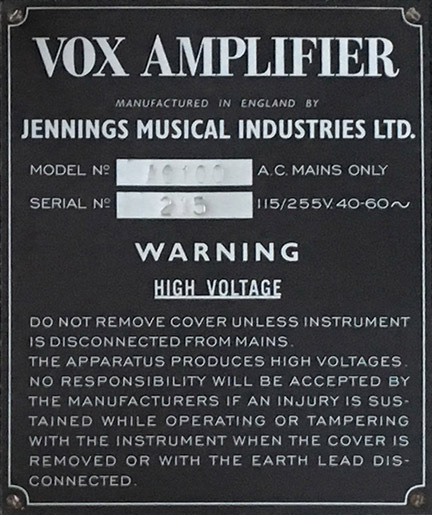 The chassis design of the JMI Vox AC-100 combined a pressed steel horizontal base with a vertical assembly made of aluminum. The design of the chassis was adapted from the AC-15 and the AC-30. The steel base of the chassis supported the power supply and output amp sections of the AC-100. The use of steel in the chassis base not only provided strength but also electronically isolated the high voltage (and hum producing) section of the power supply and output amp from rest of the amplifier. The power transformer and output transformers were located at opposite ends of the chassis base to provide proper balance. "L" brackets mounted to the top of the power and output transformers strengthened and supported the vertical aluminum portion of the chassis. The sockets for the EL34 power tubes were suspended in a tray below the top of the steel base. 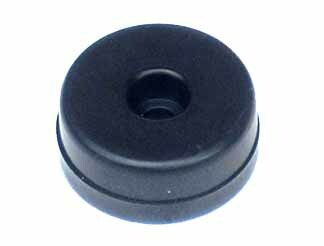 This improved air circulation inside the cabinet and provided additional clearance between the cabinet and the tops of the power tubes. 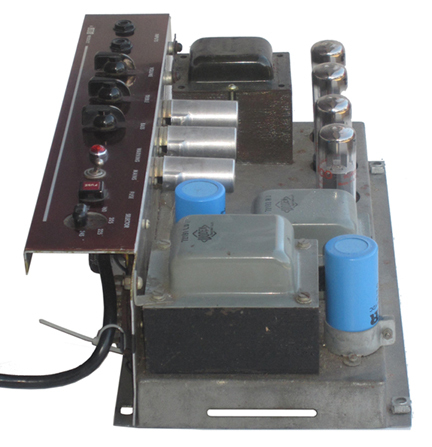 The AC-100 "80-100 Watt" power supply circuit included a power transformer, a plug style mains voltage selector, two fuses, four BY100 silicon diodes, two large filter or "smoothing" capacitors and a 10H 250 mA choke. The AC-100 "80-100 Watt" chassis was equipped exclusively with a Woden 72191 power transformer. The primary, or input side of the transformer had five taps. 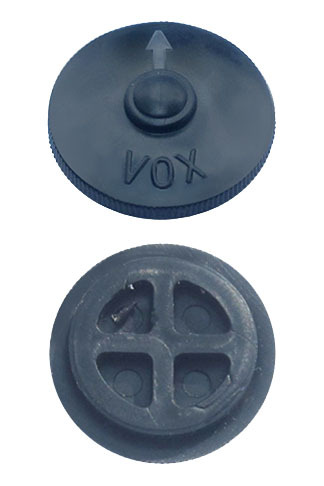 When combined with the control panel mounted plug style voltage selector, these taps allowed the AC-100 to accommodate the various mains voltages throughout the world. A 3A control panel mounted fuse (FS1) protected the primary side of the power transformer from current surges. The secondary side of the power transformer had three windings. A 350 VAC winding powered the B+ circuit. One center-tapped 6.3 VAC 6.5A winding powered the tube filaments for the EL34 output tubes while a second 6.3 VAC 2A center-tapped winding powered the preamp tube filaments. This separation of the preamp and output tube heater windings is quite unusual. It virtually elminated any chance of interaction between the preamp and output amp stages. 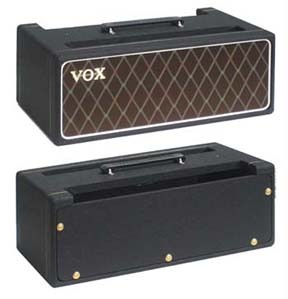 I cannot suggest another guitar amplifier that used this dual heater design. 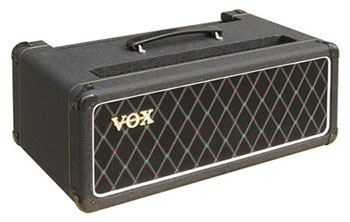 The AC-100 head was the first tube amp design from Vox that did not include a valve rectifier. 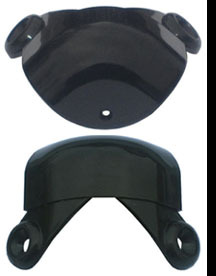 The AC-100 utilized a bridge of four BY100 diodes (MR1 - MR4) for DC rectification. 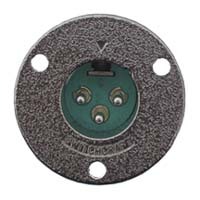 AC-100 amps with the "80-100 Watt" circuit were normally equipped with a unique horizontally oriented 10H 250 mA Woden choke (p/n #79213). 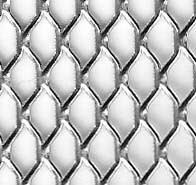 This choke is easily spotted through the upper ventilation grill and is a certain indicator that the head is a first generation "80-100 Watt" AC-100 Mk I amplifier (see photo at right). The choke was straddled by two twin 50uf filter capacitors (C18 and C19) wired in parallel, yielding 100 uf on each to smooth the AC ripple in the 430 VDC B+ power supply. An internally mounted 1A fuse protected the B+ power supply from damage caused by internal short circuits. 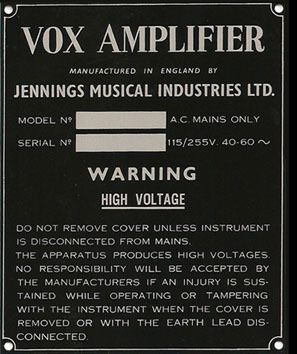 V2 was a 12AX7 (ECC83), another dual triode tube. 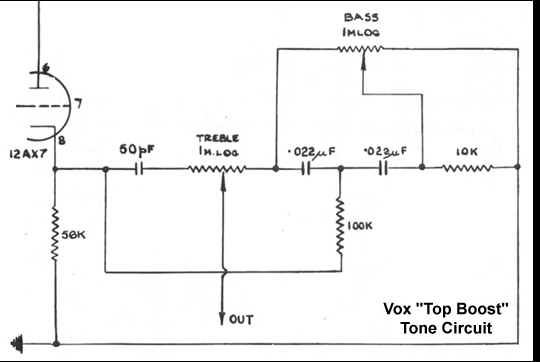 The triodes of the 12AX7 have a gain factor of 100, meaning each will amplify the signal input one hundred times. 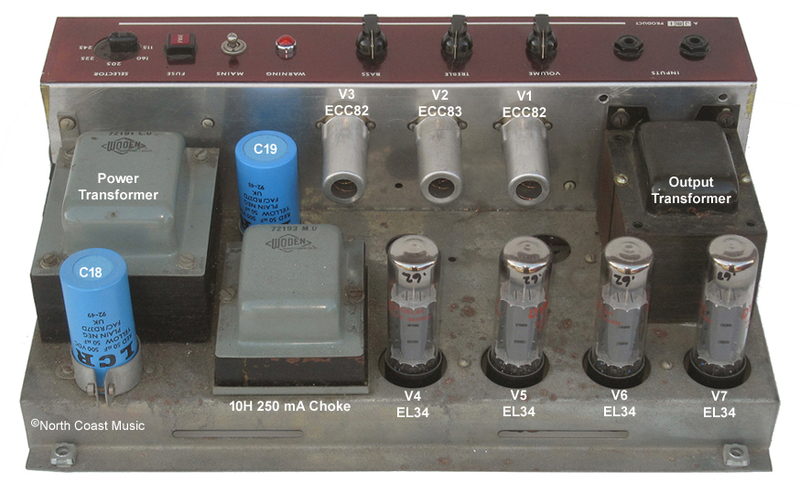 In the AC-100 circuit, the first triode was used as an additional preamp gain stage. The second triode powered the "Top Boost" tone controls (shown at left), identical to the circuit in top boosted AC-30 amps. All amplifiers using a "push-pull" circuit design, such as the AC-100, need to have a phase inverter circuit. The phase inverter converts the audio signal from the preamp into two equal but opposite waveforms. Each waveform from the phase inverter feeds one side of the push-pull output amplifier. The output tubes then connect to opposite sides of the primary of the output transformer. The original and inverted signals emerge from the output transformer as a single amplified signal. Tube V3, a 12AU7, powers the AC-100 phase inverter circuit.